Positive: Low heat; good touchscreen; decent battery life; quite reasonable price. Negative: Low brightness and contrast of the display. The HP Pavilion SleekbookTouchSmart 11-e010sg is a compact notebook with touchscreen capabilities. It is aimed at the average on-the-go user. The Midnight Black interior and silver anodized case with brush stroke pattern makes for a good looking setup. Weighing in at just 1.5 kg, this notebook can be carried easily. Nevertheless, it packs a decent amount of performance for everyday tasks. The Windows 8 device sports an 11.6 inch BrightView HD touchscreen with crisp and vivid colors. At the core of the device is an AMD Dual-core APU clocked at 1 GHz with Radeon HD A4-1250 8210 graphics card and 4 GB DDR3L RAM. There is a 500GB hard drive to store plenty of content. 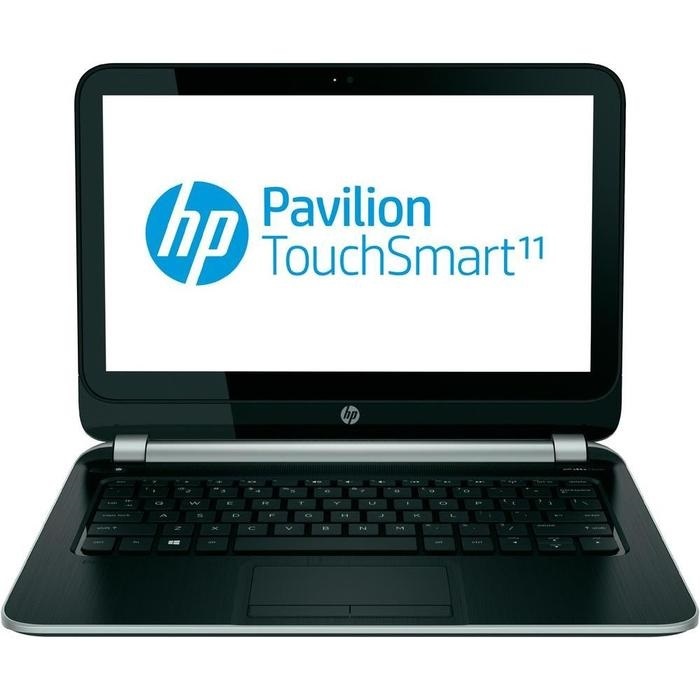 Other features include 2 USB 3.0 ports, 1 USB 2.0 port, 802.11 b/g/n Wi-Fi support, HP TrueVision HD webcam and HP CoolSense which claims to provide automatic air conditioning depending on the usage of the notebook. The touchscreen is precise with 10-point touch detection making it very functional. There is an integrated 3 cells Lithium-ion battery that enables the notebook to keep its slim profile while maintaining a decent battery life. An integrated GCN-based GPU with 128 shader units and no dedicated VRAM. It is typically clocked at 300 MHz and paired with AMD A4-1250 "Temash" and E1-2100 "Kabini" APUs. A4-1250: Dual-core APU for low-end ultraportables and tablets, codenamed Temash. Based on the Jaguar architecture. Integrates a Radeon HD 8210 graphics card.» Further information can be found in our Comparison of Mobile Processsors.